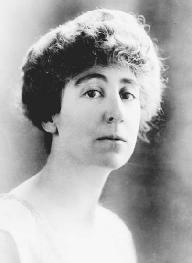 Jeannette Pickering Rankin of Montana was the first woman in U.S. history to be elected to the U.S. House of Representatives. A nonconformist Republican, she served two nonconsecutive terms in the House. Rankin is best remembered for her opposition to war. In 1917 she voted against the entry of the United States into World War I, and in 1941 she took the same position against U.S. involvement in World War II. During the 1960s Rankin protested U.S. military action in Southeast Asia. Rankin was born on June 11, 1880, on a ranch near Missoula, Montana. The oldest of seven children, Rankin was first among a family of high achievers. One of Rankin's sisters became dean of women at the University of Montana, and another taught in the English department there. Rankin's only brother and another sister became well-known, politically connected attorneys. Rankin was an intelligent but undistinguished student. She graduated from the University of Montana in 1902 with a bachelor's degree in biology and then taught school for six years. In 1908 she left Montana to seek other challenges. Earlier Rankin had visited Boston where she saw urban slums for the first time. She vowed to help improve the living and working conditions of poor Americans. In 1908 Rankin entered the New York School of Philanthropy in New York City (renamed the Columbia School of Social Work) and became a social worker. In 1910 Rankin moved to Spokane, Washington, to work in a children's home. Inspired by the supporters of women's suffrage, Rankin concluded that good legislation was more effective than social work in solving society's problems. She joined the suffrage movement in Washington and campaigned successfully for an amendment to the state constitution that gave women the right to vote. After victory in Washington, Rankin returned to her native Montana to work for women's suffrage. In what was a bold move at the time, Rankin addressed the state legislature on the issue, reminding lawmakers that all citizens in a democracy deserved a voice. Her Lobbying and organizing efforts paid off, and Montana gave women the right to vote. Rankin continued to spread her message by traveling across the country, giving pro-suffrage speeches. She became a prominent member of the National American Woman Suffrage Association. At the same time, Rankin also became involved in the turn-of-the-century peace movement, helping establish the Women's Peace Party. In 1917 Rankin decided to run for election to the U.S. House of Representatives. Montana had only one congressional district at the time because of its small population. Rankin campaigned for a federal suffrage amendment, stricter employment laws to protect women and children, and continued neutrality in the war being waged in Europe. She won the election by a very narrow margin, and at age thirty-six became the first woman to serve in the U.S. House of Representatives. Soon after she took office, Rankin's position on U.S. neutrality was tested. President woodrow wilson sought a U.S. declaration of war against Germany. On April 6, 1917, Rankin voted against U.S. involvement in World War I. Although forty-nine other representatives cast negative votes, Rankin's vote was widely publicized—and criticized—because she was the only female member of Congress. Rankin was not reelected to Congress in 1918, in part because of her antiwar vote but also because she had antagonized powerful mining interests in Montana. After her defeat Rankin resumed her work with the peace movement. She was a delegate to the Women's International Conference on Permanent Peace in Zurich where women analyzed the Versailles Peace Treaty of World War I. This process led to the formation of the Women's International League for Peace and Freedom. In 1928 Rankin organized the Georgia Peace Society and in the 1930s she was a lobbyist for the National Council for the Prevention of War. When war erupted again in Europe in 1939, Rankin was convinced that most U.S. citizens shared her views on neutrality. She returned to Montana to run for the House of Representatives. Rankin was reelected and reentered Congress in 1941. The bombing of Pearl Harbor by Japan on December 7, 1941, shattered widespread support for U.S. neutrality. This time when President franklin d. roosevelt sought a declaration of war against Japan, Rankin was the only legislator to vote against it. Her vote, although consistent with her two decades of work in the international peace movement, was roundly criticized as unpatriotic. Rankin's political career was irreparably damaged, and she did not run for reelection. During the 1950s and early 1960s, Rankin traveled abroad and lived modestly in Georgia. The Vietnam War drew her back into the public spotlight. In 1968 she led the Jeannette Rankin Brigade, a half-million women demonstrating in Washington, D.C., against U.S. military presence in Southeast Asia. In 1969 she took part in antiwar protests in South Carolina and Georgia. Rankin died on May 18, 1973, in Carmel, California. Davidson, Sue. 1994. A Heart in Politics: Jeannette Rankin and Patsy T. Mink. Seattle: Seal Press. Smith, Norma. 2002. Jeannette Rankin, America's Conscience. Helena: Montana Historical Society Press. Stineman, Esther. 1980. American Political Women: Contemporary and Historical Profiles. Littleton, Colo.: Libraries Unlimited.